Everything you may need to know in order to join us at ConFusion. 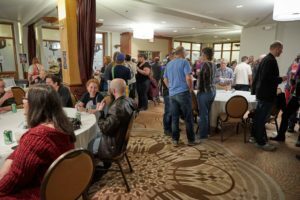 Attendee: Most of the people at ConFusion are simply there to have a good time, meet up with friends, and attend panels and events that happen at the con. These are attendees, and we love you! You are the reason ConFusion happens every year. To come to ConFusion as an Attendee you will need to purchase a membership. Panelist/Presenter/Game Master: ConFusion offers some amazing programming each year which is made possible by amazing people you give their time during the convention to be apart of panels, run games, and give concerts or presentations. We have many tracks and are always on the lookout for interesting and talented people. If you are interested in being a part of programming please check out our Get Involved! page. Volunteer: ConFusion can not get by without volunteers (lovingly referred to as Gophers). The convention is always in need of on-site help and we are happy to reward those that help out. If you are interested in becoming a volunteer please check out our Get Involved!page. Gopher Hole: Crash Space for volunteers who have worked at least two hours. Space is limited. Reimbursement/Roll-Over: Contingent upon the conventions success, ConFusion will reimburse a volunteers membership for helping out at the con for 10 hours. You can also pre-register for the following year in exchange for 8 hours. Staff Member/ConCom:ConFusion is lucky to have a dedicated staff and convention committee that works tirelessly all year to put on an amazing event. If you are interested in being a part of this amazing group of people check out our Get Involved! page. Note: Everyone who comes to ConFusion is expected to understand and follow ConFusion’s policies. Pre-registration is open until December 31st 11:59pm. This membership is offered at a discounted rate and is great for those who are certain of their attendance. At the Door registration will be available on-site and is a better option for those who may not be sure if they will be able to attend, as ConFusion does not offer refunds or transfers. Fly: The closest airport to the hotel is the Detroit Metro Airport. The hotel does not offer a shuttle service and is not within walking distance, so please make arrangments beyond your flight. NE on Wm. G. Rogell Dr. towards E Service Rd. Wm. G. Rogell Dr. becomes Merriman Rd. Merge onto I-94 E towards Detroit. M-39/Southfield Fwy/Pelham Rd. exit. Merge onto M-39 N/Southfield Fwy. towards Ford Rd (exit7) west, 2nd light, right. I-94 East to M-39 North (Southfield Freeway) to Ford Rd. (Exit 7) West. Once on Ford Rd. West, at 2nd light turn right. I-96 East to M-39 South (Southfield Freeway) to Ford Rd. (Exit 7) West. Once on Ford Rd. West, at 1st light turn right. I-94 West to M-39 North (Southfield Freeway) to Ford Rd. (Exit 7) West. Once on Ford Rd. West, at 2nd light turn right. I-75 North to M-39 North (Southfield Freeway) to Ford Rd. (Exit 7) West. Once on Ford Rd. West, at 2nd light turn right. US-24 (Telegraph Rd) to Ford Rd. East (Right Turn) and travel . 3 mi., turn left just before Southfield Freeway entrance. Staying at the DoubleTree Detroit Dearborn: Booking a room is easy, just follow the link on our Hotel page. Sharing Rooms: If you are looking for someone to help split the cost of a room, post to our Facebook Group/Page or Twitter. Within Walking Distance: There are plenty of eating options within close range of the hotel, but remember it will be January in Michigan, so if you do venture out, dress warmly. For a Yelp search of places within walking distance, click HERE. Around Town: If you have access to a vehicle, Dearborn and the surrounding area have some amazing places to eat. For a Yelp search of high rated places in the surrounding area, click HERE. Attend a Party at ConFusion? Each year attendees of ConFusion get in on the fun by throwing some amazing parties. Some of the party hosts are other conventions or clubs that want to let ConFusion attendees know about their presence or upcoming events. Others are thrown by fans who want to share their love of something with others. Many of the parties have themes. VOTE FOR BEST PARTY HERE! Some parties will be adult only and any party serving alcohol will be carding, so please carry your photo ID with you. Host a Party at ConFusion?